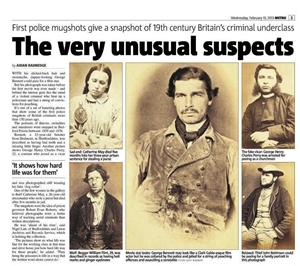 This haunting collection of photos shows some of the FIRST ever police mugshots of criminals in Britain – taken more than 150 YEARS ago. The vintage portraits of thieves, poachers and murderer were snapped in Bedford Prison between 1859 and 1876. The book of mugshots is held by Bedfordshire and Luton Archives and Records Service – which was the first local record office in the UK and is now celebrating its centenary. 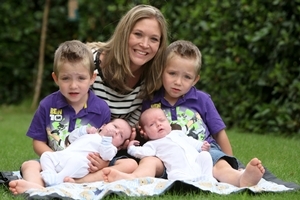 A woman has given birth to twin boys on the SAME date as their elder twin brothers at odds of 25 MILLION to one. Kim Hefer, 29, was “gobsmacked” when babies Devon and Logan arrived four weeks early on July 18 – the birthday of their four-year-old brothers Tristan and Blake. It is believed to be the FIRST time in the UK a pair of naturally conceived twin boys have shared a birthday with their twin brothers. 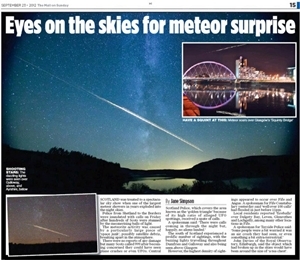 Cyclists were stunned to see a motorist driving his CAR on a narrow CYCLE bridge over a railway line. 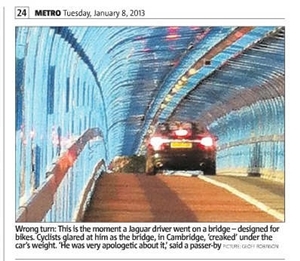 They heard the £2 million bridge “creaking and cracking” as the Jaguar driver squeezed onto the famous covered bike bridge in Cambridge city centre. 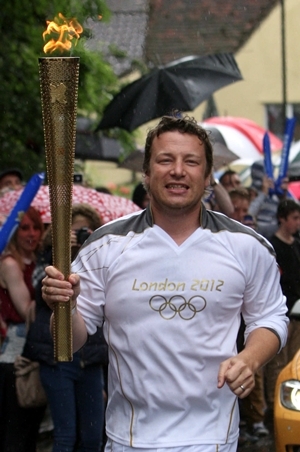 Celebrity chef Jamie Oliver was joined by his family as he ran with the Olympic Torch through the village where he went to school. Thousands braved the rain to watch the 37-year-old run through the High Street in Newport, Essex. A doctor has become the FIRST person to eat an entire plateful of the world’s HOTTEST curry – 10,000 times hotter than a bottle of Tabasco sauce. 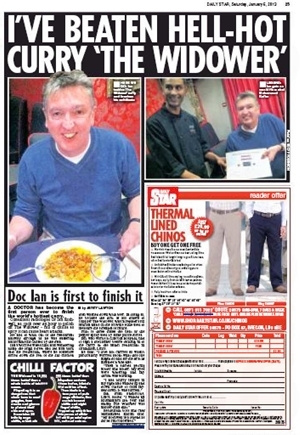 Ian Rothwell, 55, started hallucinating half way through eating the fiery Widower chicken curry, which hits a whopping six million Scovilles. The dish at the Bindi Indian restaurant in Grantham, Lincs, consists of around 20 Naga Infinity chillis – the second hottest on the planet. 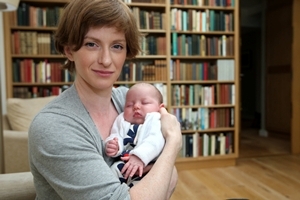 A Cambridge University student has graduated with a FIRST CLASS degree despite sitting her exams just 28 HOURS after GIVING BIRTH. Isobel Cohen, who studied English, was heavily dosed up on painkillers and her new baby daughter Beatrice was in intensive care when she sat her finals in the maternity ward. 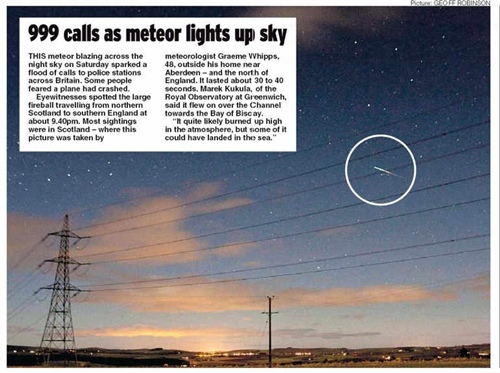 A man has spent up to five hours EVERY day for TWO YEARS taking a wacky photo of himself and posting it online. 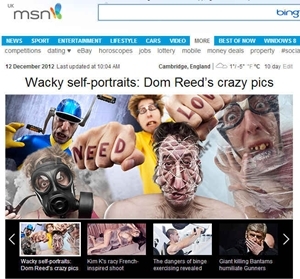 Dominick Reed, 40, has dedicated around 3650 hours to taking the bizarre snapshots, wearing false teeth, unusual wigs and using clever photo shop trickery. Most parents write diaries or take photos to record their children growing up but one mum has DRAWN A PICTURE of her son almost EVERY DAY of his life. 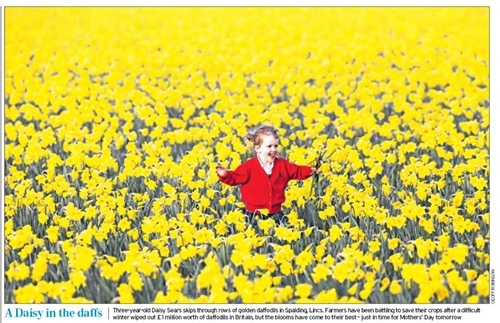 Angie Stevens began doodling son Gruff shortly after he was born and now two years later she has drawn more than 700 pictures of him and his two older sisters, Millie, 9 and Evie, 4. 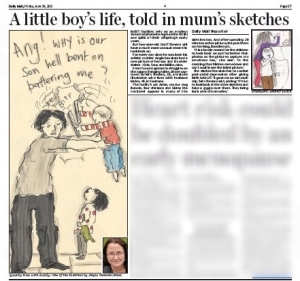 The 38-year-old spends between around 20 minutes each evening sketching a new picture of her three children to document their day, then posts them on her blog, "Doodlemum". 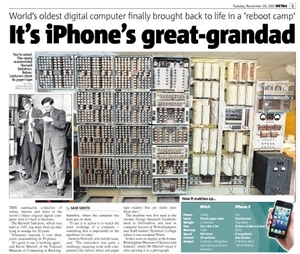 The world’s OLDEST original working digital computer has been rebooted - after lying forgotten in storage for 20 years. The 61-year-old Harwell Dekatron (aka WITCH) computer has clattered back into action at the National Museum of Computing, based at Bletchley Park, Bucks, after a mammoth three-year restoration project. A schoolboy had a shock when he returned from the playground to find a FOX asleep in his BED. 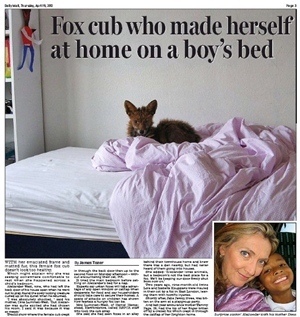 Alexander West, nine, was stunned to see the baby fox snuggled in his duvet in his bedroom on the SECOND floor of his home. The youngster had left the back door of the townhouse open when he ran outside to play and the female fox had crept inside and made herself at home. 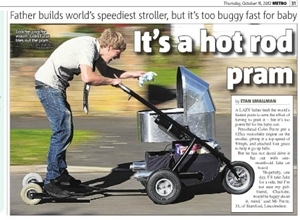 Plumber Colin Furze has added a powerful engine to his silver metal pushchair which gives it an incredible top speed of 50mph. Historians have uncovered photos of the world's FIRST children's SLIDE - built 90 YEARS ago from a plank of wood with NO sides and NO safety surface. 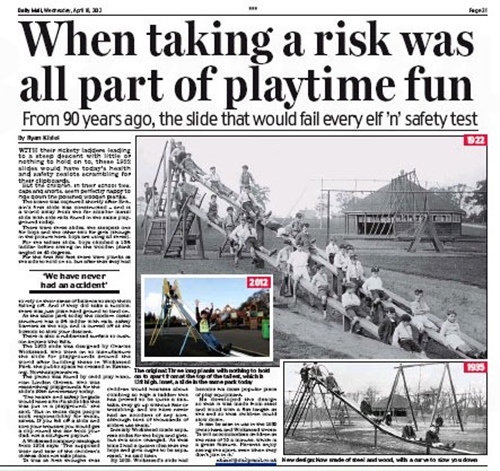 Girls and boys can be seen climbing the dangerously steep four-metre high ladder, then pushing themselves down the long wooden plank which has nothing to stop them falling off. 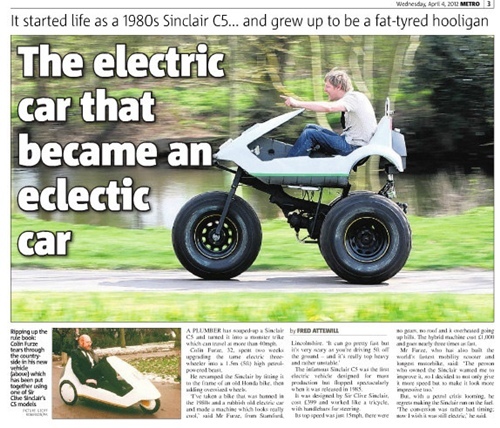 A man has pimped a Sinclair C5 and turned it into a MONSTER bike which can go more than 40mph. Colin Furze, 32, spent two weeks upgrading the electric three-wheeler into a petrol-powered machine, which towers five foot off the ground. He souped up the slow Sinclair by fitting it to the frame of an old Honda bike, then added giant two-foot tall wheels. 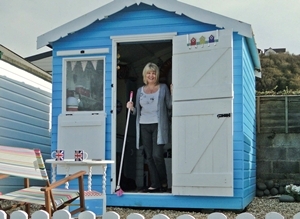 A woman who dreamed of owning a beach hut since she was a little girl has won a national competition to find Britain’s best BEACH HUT. Patricia Bevan, 65, beat hundreds of entries to win the annual contest with her patriotic red, white and blue hut, complete with bunting and Union Jacks. 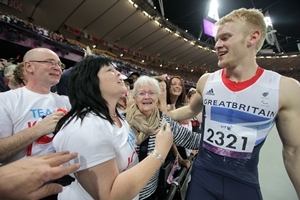 Jonnie Peacock has become the fastest amputee sprinter in the world after winning gold in the T44 100 metre final. The 19-year-old British “blade-runner” beat the favourite South African Oscar Pistorious in front of 80,000 people with a time of just 10.9 seconds. 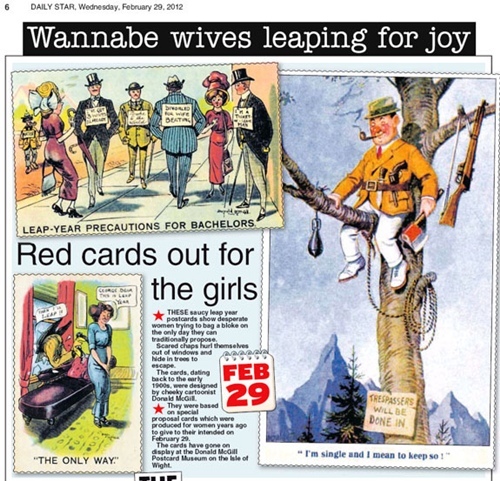 A museum has unearthed a collection of rare marriage proposal LEAP YEAR cards from a bygone era when it was only deemed proper for women to pop the question on February 29. The hilarious tongue-in-cheek cards by saucy postcard artist Donald McGill feature desperate women trying to ensnare a husband on the only day they could respectably propose.